With 20 years of excellence, St. Mary Academy remains on the leading edge of Catholic education! 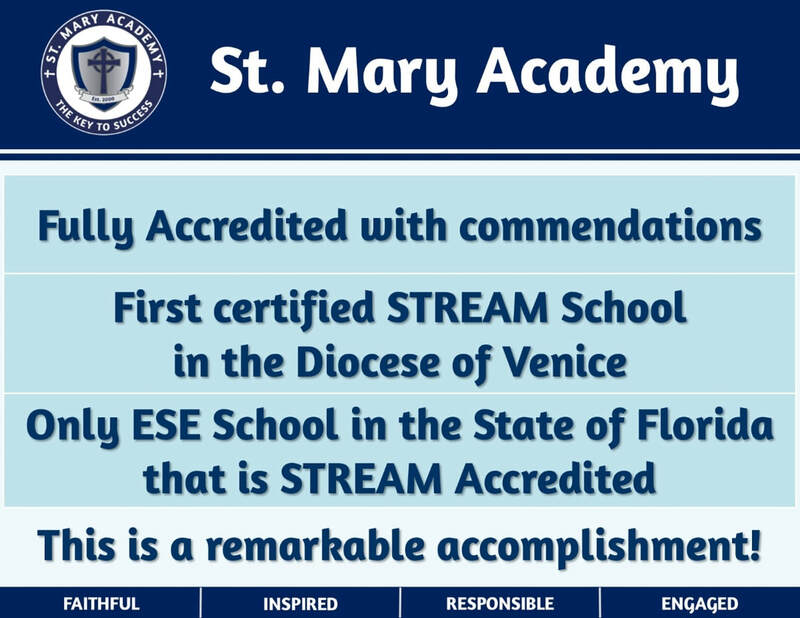 St. Mary Academy is pleased to announce that we have earned the prestigious title of a STREAM school, as well as our re-accreditation. All Catholic schools in the state of Florida complete an ongoing seven year accreditation process. St. Mary Academy was recently evaluated in this process, by the Florida Catholic Conference. During the evaluation, an accrediting team of administrators, from schools within our state, visited our school to thoroughly assess and validate our compliance with all the requirements. We are proud to announce that St. Mary Academy not only fully met each of the 34 benchmarks, we exceeded most! We are also excited to announce St. Mary Academy was evaluated as a STREAM school. As a 21st century school, St. Mary Academy excels in developing and implementing meaningful lessons for our students, across all subject areas. The accrediting team assessed our benchmarks, evidence, and classroom observations for an in depth examination of our school. The team awarded St. Mary Academy the title of a certified STREAM school! St. Mary Academy is the first school in the Diocese of Venice and the first ESE school in the state of Florida to earn this prestigious certification. We join just three other schools in the state with a STREAM accreditation. St. Mary Academy educates students for their future and makes learning relevant and engaging. We are proud of the superior education our school offers and look forward to continued success and growth. 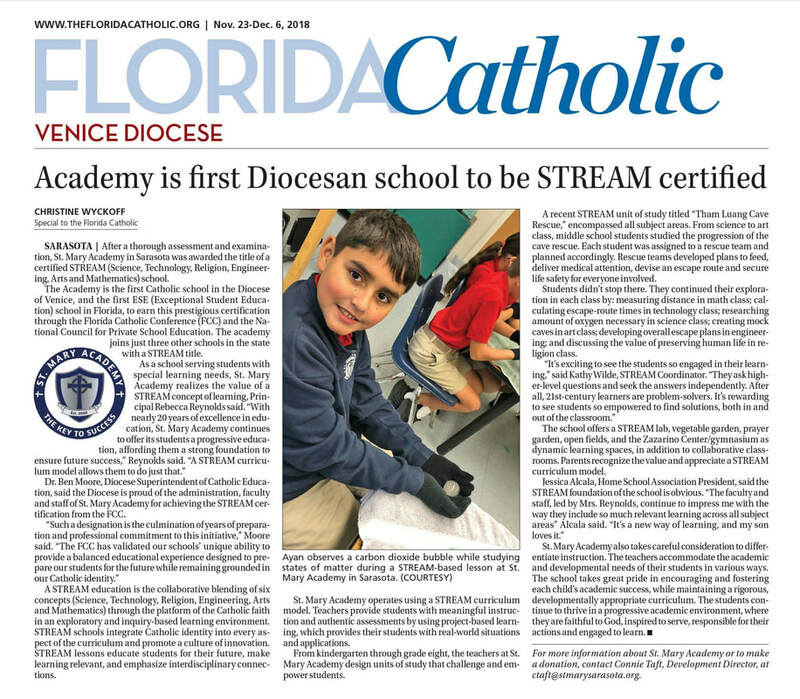 Sarasota | After a thorough assessment and examination, St. Mary Academy in Sarasota was awarded the title of a certified STREAM (Science, Technology, Religion, Engineering, Arts and Mathematics) school. The Academy is the first Catholic school in the Diocese of Venice, and the first ESE (Exceptional Student Education) school in Florida, to earn this prestigious certification through the Florida Catholic Conference (FCC) and the National Council for Private School Education. The academy joins just three other schools in the state with a STREAM title. Dr. Ben Moore, Diocese Superintendent of Catholic Education, said the Diocese is proud of the administration, faculty and staff of St. Mary Academy for achieving the STREAM certification from the FCC. A STREAM education is the collaborative blending of six concepts (Science, Technology, Religion, Engineering, Arts and Mathematics) through the platform of the Catholic faith in an exploratory and inquiry-based learning environment. STREAM schools integrate Catholic identity into every aspect of the curriculum and promote a culture of innovation. STREAM lessons educate students for their future, make learning relevant, and emphasize interdisciplinary connections. St. Mary Academy operates using a STREAM curriculum model. Teachers provide students with meaningful instruction and authentic assessments by using project-based learning, which provides their students with real-world situations and applications. From kindergarten through grade eight, the teachers at St. Mary Academy design units of study that challenge and empower students. A recent STREAM unit of study titled “Tham Luang Cave Rescue,” encompassed all subject areas. From science to art class, middle school students studied the progression of the cave rescue. Each student was assigned to a rescue team and planned accordingly. Rescue teams developed plans to feed, deliver medical attention, devise an escape route and secure life safety for everyone involved. Students didn’t stop there. They continued their exploration in each class by: measuring distance in math class; calculating escape-route times in technology class; researching amount of oxygen necessary in science class; creating mock caves in art class; developing overall escape plans in engineering; and discussing the value of preserving human life in religion class. The school offers a STREAM lab, vegetable garden, prayer garden, open fields, and the Zazarino Center/gymnasium as dynamic learning spaces, in addition to collaborative classrooms. Parents recognize the value and appreciate a STREAM curriculum model. St. Mary Academy also takes careful consideration to differentiate instruction. The teachers accommodate the academic and developmental needs of their students in various ways. The school takes great pride in encouraging and fostering each child’s academic success, while maintaining a rigorous, developmentally appropriate curriculum. The students continue to thrive in a progressive academic environment, where they are faithful to God, inspired to serve, responsible for their actions and engaged to learn. For more information about St. Mary Academy or to make a donation, please contact Connie Taft, Director of Development and Marketing at ctaft@stmarysarasota.org.